Moonfire Publishing – Magical realism, paranormal thrillers, speculative fiction realized through both text and image. Moonfire Publishing is an independent press specializing in speculative titles ranging from fantasy and science fiction stories to humorous works that touch upon paranormal themes. We seek out the strange, the unusual, the macabre, and the unconventional, and our titles reflect that vision. Follow this site today for updates and announcements. What Haunts Us, by Loren Niemi. A fresh, new collection of ghost stories by award-winning storyteller Loren Niemi. His first published story collection is an evocative compendium of stories he has performed on many stages, along with new explorations of paranormal mysteries which arise at the intersection of the ordinary, flicker in the imagination, and dwell in memory. “Storytelling is my life’s work. From the Turtle Mountain Reservation in North Dakota to the Great Wall of China, from Belfast, Northern Ireland, to PS 122 in NYC, and at Fringe Festivals across America, I’ve explored the power of narrative and the beauty of poetry to illuminate what it is to be human and why it matters.” Now available in Paperback, Amazon Kindle and Smashwords E-Book Editions. Go Fork Ye Crooked Spoon, and Let Me Live My Knife! 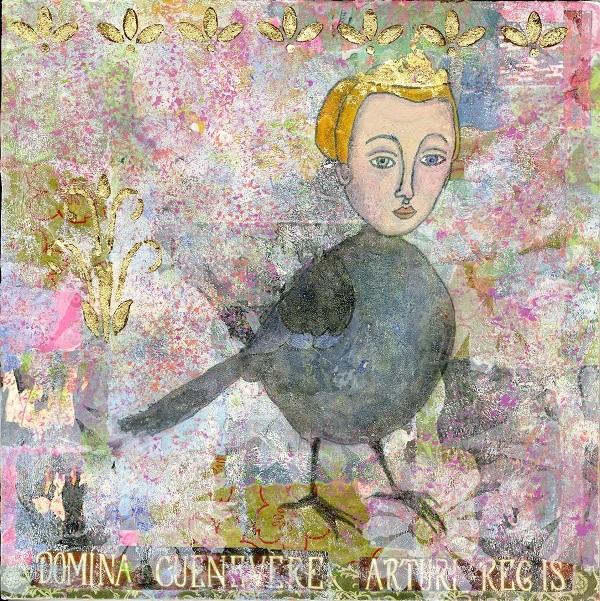 by Sheila Marshall. This whimsical guide to cooking and carving meats is written in Shakespearean language and includes amusing quotations from the Bard. It is filled with a collection of striking black and white illustrations by Twin Cities artist Sarah Marie Wash that complement the instructive and irreverent text. Learn to cook and carve, with hearty laughs all the while. Spring 2019. 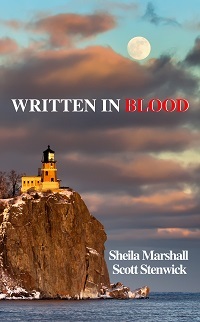 Written in Blood, by Sheila Marshall and Scott Stenwick. David Killian is an ancient vampire with the power to write the fate of the Northland in his own blood. When he writes the ideal lover and companion into life, he summons artist Kristie Slay from Chicago to Castle Danger on the North Shore of Lake Superior. Kristie is drawn by the town’s mystery, and the surprise of a new love springing from her past. But she carries with her a hidden secret that may lead to both their undoing. Spring 2019. Ipswich, by Scott Michael Stenwick. This long-awaited sequel to Scott Stenwick’s 2009 debut urban fantasy novel Arcana tells the story of Sara Winchester, a young heiress and newly-empowered magician. With the help of the centuries-old order of magicians known as the Guild, she explores the mystery of her mother’s untimely death. On her travels she must face a killer who can control the spirits of the dead, and the remnants of an order of dark magicians who seek the Guild’s destruction. Now available in Paperback, Amazon Kindle, and Smashwords E-Book editions. The Vampires’ Guide to Dining, by Moonfire. Everybody knows that vampires don’t drink wine. But what do they eat? In this humorous cookbook and compatibility guide, author Moonfire (Sheila Marshall) explores the world of dating and hosting the various personality types that make up the vast legions of the undead. The book is filled with funny and imaginative illustrations, and is a perfect handbook for undead-themed party planning. Now available in Amazon Kindle and Smashwords E-Book editions. 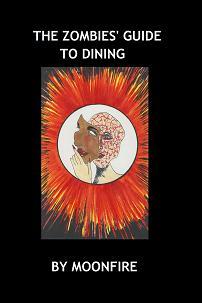 The Zombies’ Guide to Dining, by Moonfire. Let’s face it – you just can’t eat all brains, all the time. There comes a point where you need some variety in your diet. 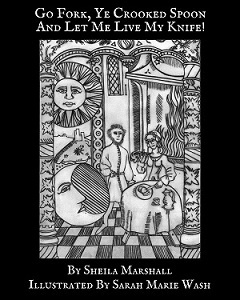 In this follow-up to The Vampires’ Guide to Dining, author Moonfire (Sheila Marshall) moves on from vampires to the world of zombies, outlining their personality types and suggesting recipes for their unique anatomies. Like the previous volume, the book is filled with humorous illustrations and plenty of new ideas for navigating the world of the undead. Now available in Amazon Kindle and Smashwords E-Book editions.